One of our best qualities is our location! In addition to our pet-friendly hotel rooms, we are located within walking distance of the beautiful Laguna Lake Park dog park. Bring your furry best friend to the dog park nearby before heading back on the road. 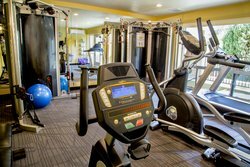 Even if you aren’t bringing a pet, we are located on Madonna Rd, steps from the iconic Madonna Inn and a variety of restaurants and the convenient Madonna Plaza Shopping center. 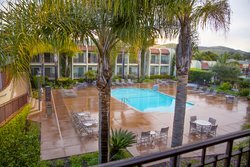 With our hotel in San Luis Obispo’s outdoor pool, welcoming atmosphere, sunny rooms—all of which feature a balcony—and range of amenities designed for function and for fun, we are the ideal place to rest your head on your trip. Stay with us just outside of downtown San Luis Obispo, at the foot of Cerro San Luis and its stunning natural beauty and sweeping views. 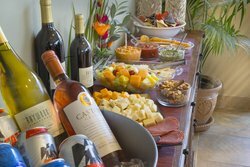 Available to Best Western Rewards members, our evening reception takes place Monday through Thursday, and we put out a selection of local beers, California wines, and light snacks. 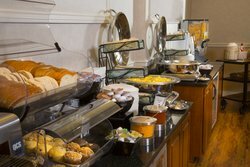 Sample cheese and crackers, chips and dips, fresh fruit, sometimes something heartier! Ask our front desk for details! Joining Best Western Rewards is completely free, and lets you collect rewards while you sleep that can go toward your next adventure. Breakfast is from 6-10AM every day. Our hotel in San Luis Obispo has a pool in the central courtyard, providing a number of poolside balconies in our rooms. Dive into the deep end, or take it easy in the hot tub by the pool. Our heated pool is open year-round every day from 8AM to 10PM. 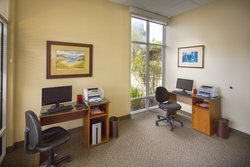 The business center by the lobby is perfect for your last-minute computer needs. Step in through the business center’s exterior entrance and use the computers and printer. Open 24 hours. Fax services can be taken care of by the front desk. Bringing your pet on your travels? 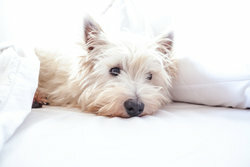 We have pet-friendly accommodations as well as close access to a nearby dog park. Please note that pets cannot be left unattended in rooms at any time. See our polices for details.